Pilot Coffee Roasters | Williamson Williamson Inc. Pilot Coffee’s Roastery, Lab, Tasting Bar, Cold Brew Production, and Distribution Centre for Direct Trade Coffee gets a 2018 upgrade! 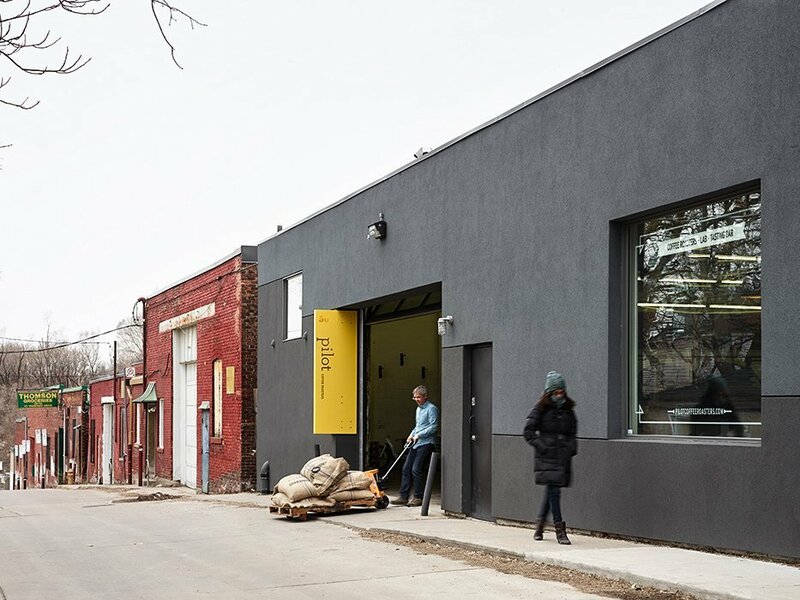 In a forgotten industrial strip on Wagstaff Drive, backing onto the Greenwood Rail Yard in Toronto’s east end, an old building supplies warehouse has been transformed into a state-of-the-art coffee facility. 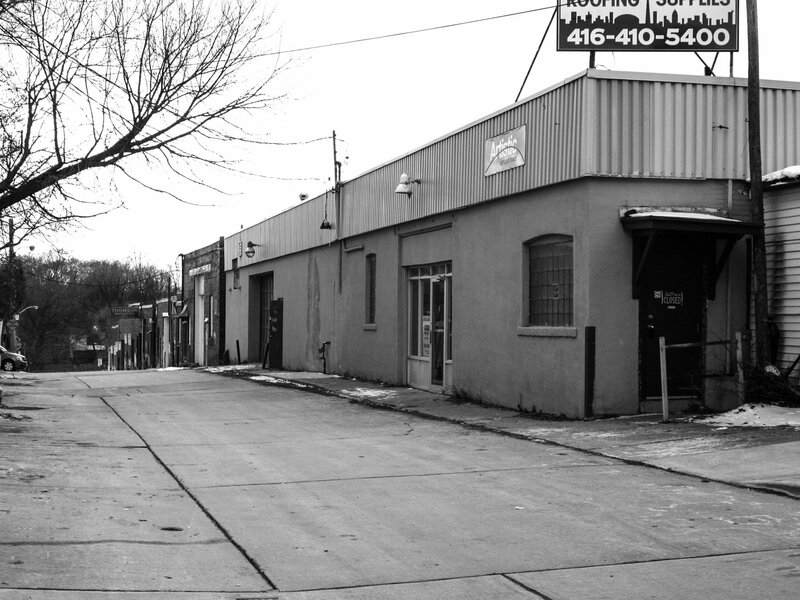 In 2014, this Pilot ‘hub’ was the first roasting facility in Toronto that was open and accessible to the public. Utilizing the open plan of the existing concrete block warehouse with exposed structure and service lines, the production cycle has been made transparent. There is a visual slice through the manufacturing process where customers, baristas, and wholesale clients can learn the narrative of the beans from their arrival from Direct Trade suppliers to their roasting and delivery using Pilot’s full-time bicycle courier. Used for tasting and scenting various blends with scientific precision, the coffee lab and cupping room is shielded from the rest of the operation. 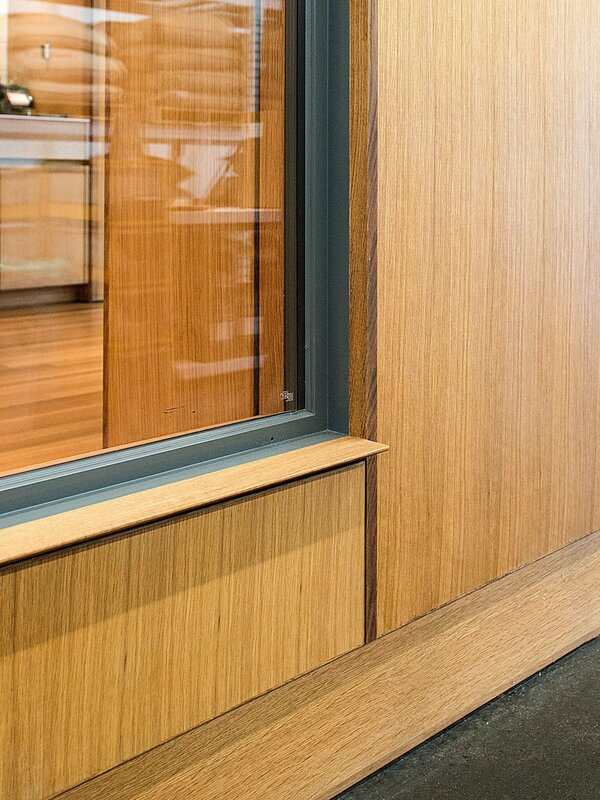 Clad in white oak paneling that is also used for the millwork shelves, drawers and cabinetry inside, it holds a bank of various coffee machines, grinders, and testing equipment and is used for training, experimentation and workshops. 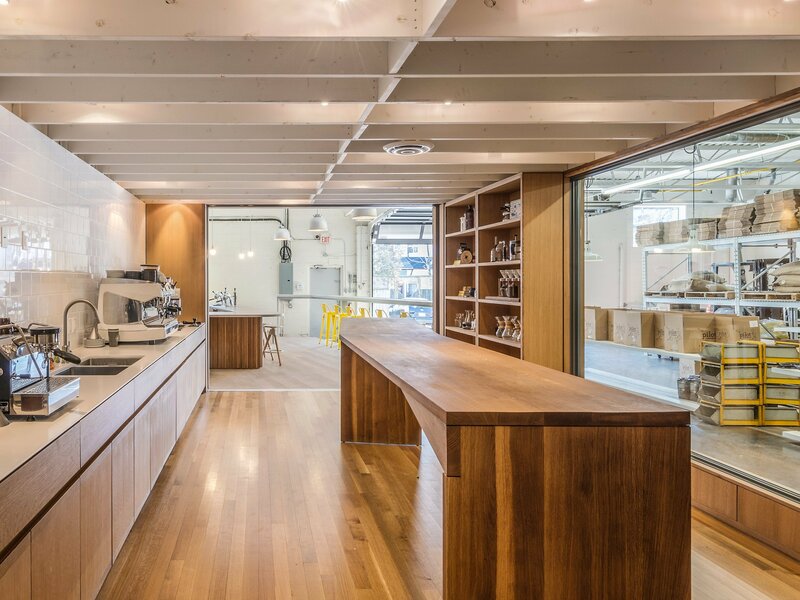 The custom cupping table overlooks the production area while a glass pocket door for soundproofing and scent containment can either close off the space or open it to the adjacent tasting bar. The central floor space houses the main production area, storage racks, and packaging tables. Behind an oversized movable glass wall, the Probat G60 roaster handles the high volume required to supply their vendors across North America. 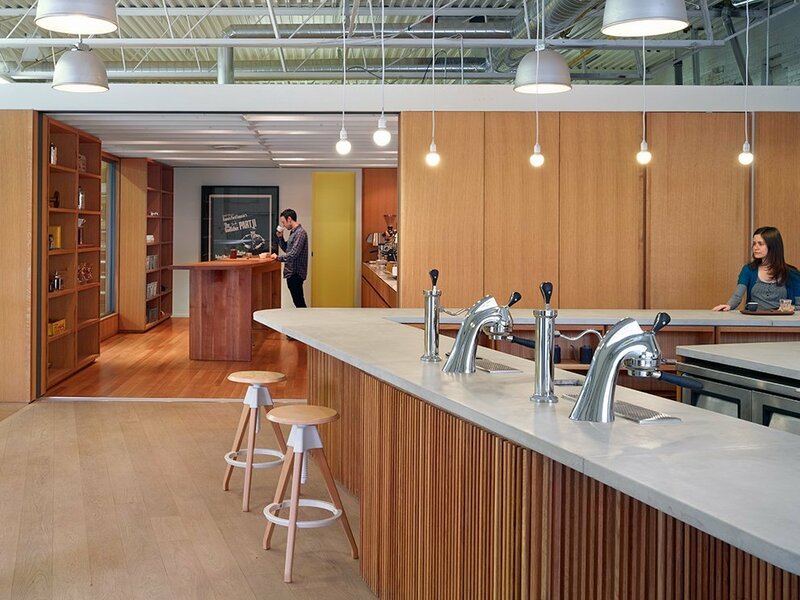 This new-concept work environment invites the public in for a first-hand artisnal coffee experience while also educating about the process and precision required to bring great coffee to the consumer. Pilot Coffee is a brand known for its continued innovation, which in 2017, resulted in the full reconfiguration of the north end of the ground floor to create a canning line for milk-based cold espresso drinks. 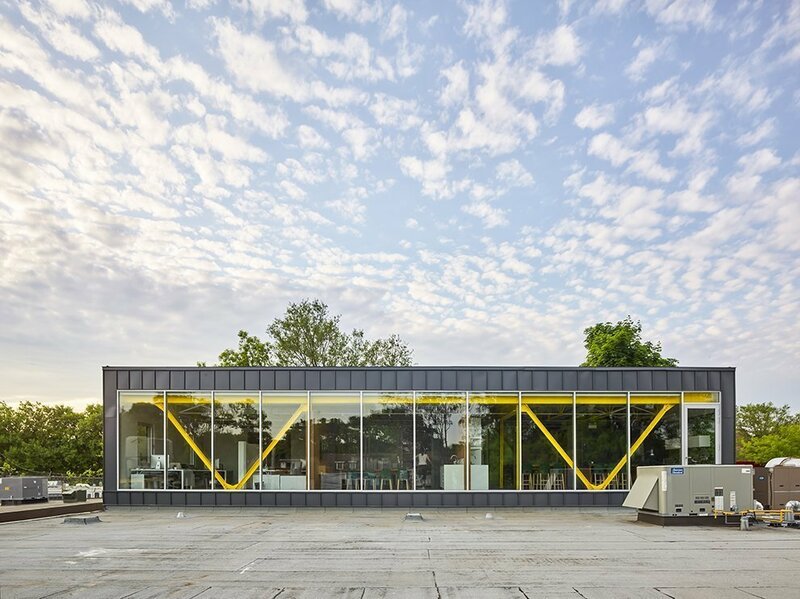 An assembly line of production, testing and canning resides behind a glazed wall, flanked by oak paneled support spaces and the new entrance to the second floor administration space. Having used every inch of the available ground floor for production, the only option to house the growing administrative staff was to add a second level. An as-of-right addition was conceived that would require no columns to penetrate the densely programmed ground floor. Extending the concrete block walls at the rear and sides, a truss was erected to span the sixty-seven-foot-long (20.4m) clear width of the building. Connecting beams support tension members, and the second floor was hung in place. 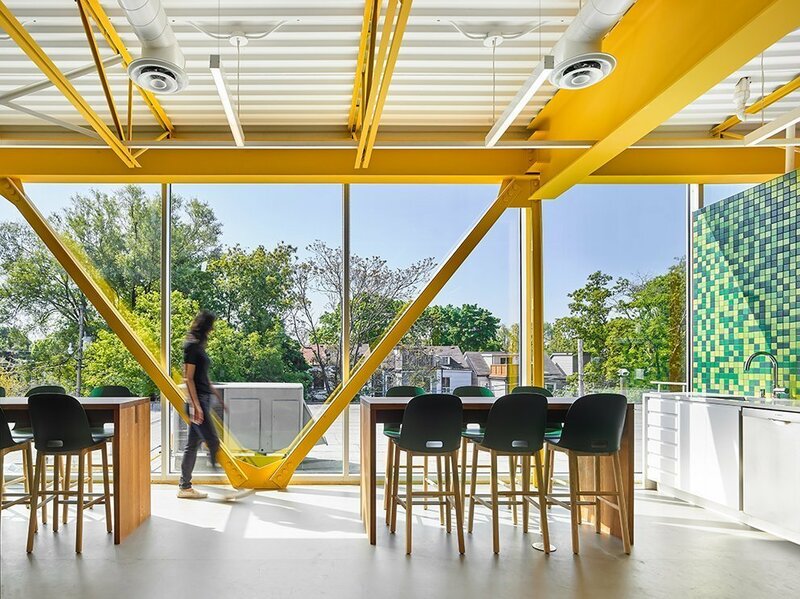 Borrowing the industrial language from the lower level, the light steel shell was fitted out with a series of wood, tile, and glass surfaces that intertwine and define each space, creating a strong datum line throughout. Offices, a cupping room, and staff lunchroom occupy the south facing windows, while a large workroom and service spaces fill the centre. 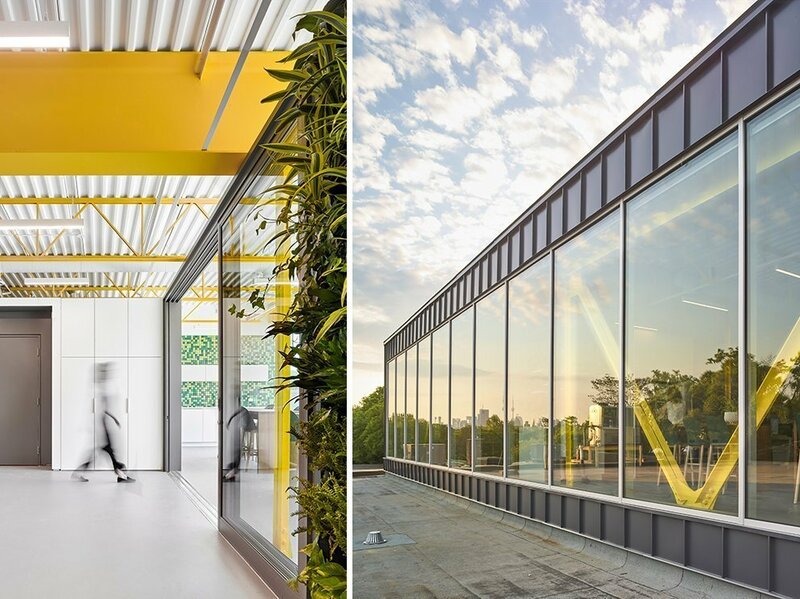 In a forgotten industrial strip backing onto the Greenwood Rail Yard in Toronto’s east end, we transformed an old building supplies warehouse into a state-of-the-art coffee facility. Named the 2014 Micro Roaster of the Year by Roast Magazine, This Pilot ‘hub’ is the first roasting facility in Toronto that is open and accessible to the public. Lower level renovation initiated by Williamson Chong.